U.S. House candidate Young Kim enjoyed a 14-point lead on Election Day as she was poised to become the first Korean-American woman elected to Congress in the nation’s history. A week later, Kim lost by 3.2 percent, leaving many stunned at the stark turn of events. In a neighboring district in Orange County, California, Mimi Walters was ahead 6,200 votes after polls closed on Election Day, but like Kim, she lost in the days that followed. Similarly, Jeff Denham and David Valadao lost their elections—particularly surprising outcomes for the traditionally conservative bastion of Orange County. The candidates all had two things in common: They were Republicans vying for U.S. House seats in California, and their elections were decided by a wave of mail-in and provisional ballots that were counted after Nov. 6 and decisively favored Democrats across the board. According to a leading election integrity expert, so-called “ballot harvesting” may have played a role in the curious election outcomes. “Most states only allow family members or someone in a voter’s household to hand deliver the voter’s completed absentee ballot to election officials,” said Hans von Spakovsky in an email statement to The Epoch Times. “This can help prevent vote harvesting, which is when campaign operatives obtain absentee ballots and change or fill in the ballots, altering the voter’s choice, or intimidate the voters into voting a particular way, and then deliver the altered or forged ballot to election officials,” said Spakovsky, a former member of the Federal Election Commission, and leader of the conservative Heritage Foundation’s Election Law Reform Initiative. In 2016, California passed a state law that unleashed campaign operatives and activists by allowing the unlimited collection of ballots by third party individuals and organizations, who often selectively target would-be voters according to their party affiliation. Such activities are deeply concerning for election watchdogs because they present widespread opportunities for fraud. 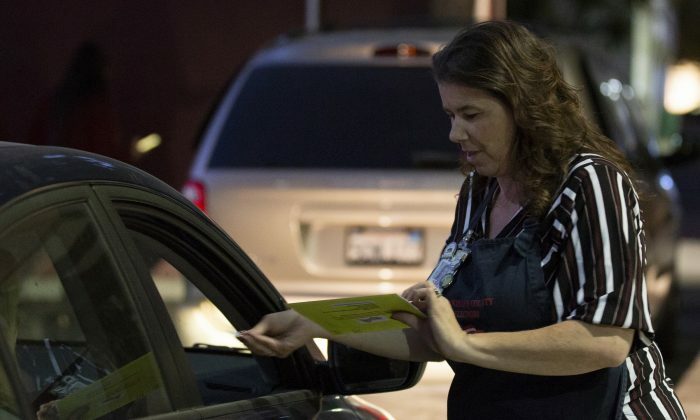 “California’s relatively new law that lifted this prohibition on non-family members delivering ballots is a way of wholesaling absentee ballot fraud and making it very easy to commit,” Spakovsky said. At least 16 states either expressly limit who can deliver absentee ballots to election officials, or outright ban ballot collecting altogether. The U.S. Supreme Court upheld an Arizona law banning third-party ballot collecting in the fall of 2016, after an illegal vote harvesting scandal occurred in 2012, involving political operatives posing as election workers. “The point of banning this practice is to keep absentee ballots out of the hands of campaign workers, party activists, and others who have an incentive to ensure only absentee ballots for their candidates make it to election officials,” said Spakovsky. This near exact scenario occurred in Texas in 2016, with indictments announced weeks before the recent Nov. 6 elections. On Oct. 12, Texas Attorney General Ken Paxton indicted four individuals on 30 felony counts of voter fraud related to ballot harvesting, which allegedly disenfranchised elderly, minority, and disabled voters. “In most cases, the voters do not even know their votes have been stolen,” Paxton said in a press release. In another interview, Logan Churchwell, communications director for the Public Interest Legal Foundation, a prominent election watchdog, said the risks of harvesting ballots and fraud are exacerbated by the astronomic rise in absentee voting—which accounted for 42 percent of California’s 12.5 million total midterm election votes, and most of the post-Election Day returns. “Absentee balloting is the most vulnerable method of voting with respect to fraud, tampering, and error (official or personal),” Churchwell told The Epoch Times. He suggested that states could limit the ill-effects of harvesting by restricting the transmission of mail ballots to either voters themselves or their designated family members or lawful assistants. “Adding third parties to that mix invites chaos and abuse,” he said.